Shipping Seller ships internationally (worldwide). See item description for shipping charges. 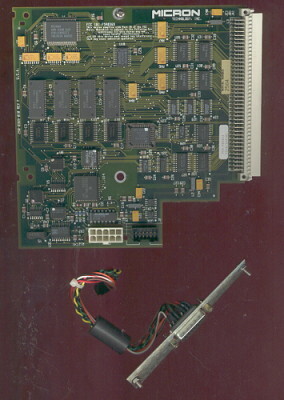 Up for auction is a Micron Video Card for use on a Macintosh SE/30. I admit I really do not know much about it other than it came from a working SE/30 that had a faulty internal monitor (so I'm parting it out). The only info I could find on Micron and SE/30 was for a video card called XCeed so I assume this is what I have here. Comes with card and 15-pin monitor jack. I assume this card is for using an external color monitor with your Mac SE/30, but I also read about a Greyscale Micron card/adapter. Here are some numbers off the card: Serial Number 2564, 250-0369-010 Rev F, P6D-900053. Shipping is $4.00 within the US (please email for non-US shipping cost). Payment of cash, check, or money order thru the mail, or PAYPAL. Insurance optional. All sales final.